So how do we did end up with such a surplus of food you ask? I’m going to let you in on a little secret. While I do plan out everything we are going to eat for the week we don’t always follow the plan. Meal planning for me is really about just making sure we have enough food for the week. But during the week things can change. Days get busy and I sometimes just don’t feel like cooking. Or maybe one meal makes more servings and lasts longer. And sometimes I’m just not in the mood for whatever it is I planned several days before. When those things happen I try to save whatever fresh foods I can and either move the meal to the next week or freeze some of the ingredients. This means we end up with random pantry staples and frozen items. I also freeze some of our leftovers. Every couple of months I like to do an inventory of what we’ve got and create a menu from there. This time I printed out the color coded grocery list from Ultimate Portion Fix and used it to create a color coded inventory. It made it much easier to fill in my containers using what we’ve already got. The weekly menu is a word doc so you can download and make changes to suit your needs. Just click on the image below to download, edit and print. 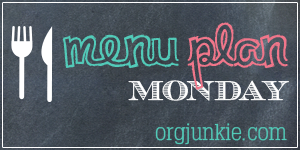 I’ve included the regular menu format and the Ultimate Portion Fix Container Count Meal Plan Template.